A colorful illustrated history celebrating 60 years of the SS United StatesComplete with deck plans, newspaper coverage, and accounts from log books and ship records, this history covers the SS United States' active service from 1952 to 1969, when she dominated the seas of Atlantic. The astonishing operational capacity of this national icon of the United States—with her red, white, and blue funnels; sleek streamlined hull; and silver-coated fittings—was shrouded in secrecy in case she was ever required to be converted to a troop carrier. Andrew Britton presents a revealing insight into the record-breaking liner, her epic maiden voyage, and how she performed in the secret sea trials. Compiled from a wealth of previously unpublished material drawn from the author's own unparalleled collection and others from around the world, this special commemorative book is packed with such ephemera as tickets, timetables, menus, keys, luggage labels, gala invitations, and pennants, as well as historical color photography from both sides of the Atlantic, including the maiden voyage departure from New York. 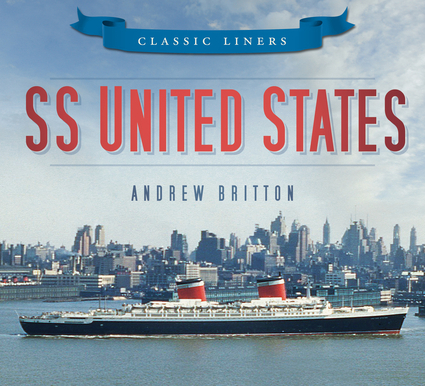 Andrew Britton is a lifelong shipping enthusiast and collector with a now vast body of photographs and ephemera, and a keen supporter of the SS United States Conservancy.